COPPELL, TX -- (MARKET WIRE) -- December 7, 2006 -- (NASDAQ: MTEX) -- Mannatech, Inc. announced today it has signed a non-binding letter of intent dated November 30th with Carrington Laboratories, Inc. to provide a supply of Manapol® powder. Manapol®, derived from the Aloe vera plant, is an original ingredient in Mannatech's flagship product, Ambrotose®. Under the terms of the letter of intent, Carrington agrees to supply Manapol® powder to Mannatech under a non-exclusive agreement for a period of up to three (3) years. The parties are working to complete the definitive agreement. Sam Caster, Chairman and Chief Executive Officer of Mannatech, stated, "This letter of intent helps secure an uninterrupted source of Manapol®, thus ensuring that we continue to meet the growing associate demand for our patented glyconutrient products. Our glyconutrient patent is another example of how Mannatech provides leading edge science and technology in the Wellness Industry." Mr. Caster also commented, "As part of our ongoing strategy to strengthen our management team, we have broadened our search for a senior level Vice President of Sales who combines both corporate and industry experience." 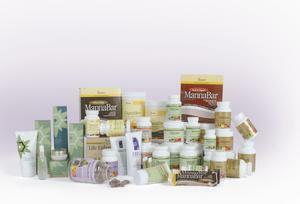 Mannatech, Incorporated is a global wellness solutions provider that develops innovative, high-quality, proprietary nutritional supplements, topical and skin care products, and weight management products that are sold through approximately 536,000 independent Associates and Members located in the United States and the international markets of Canada, Australia, the United Kingdom, Japan, New Zealand, the Republic of Korea, Taiwan, Denmark, and Germany. Please Note: This release contains "forward-looking statements" within the meaning of Section 27A of the Securities Act of 1933, as amended, Section 21E of the Securities Exchange Act of 1934, as amended, and the Private Securities Litigation Reform Act of 1995. These forward-looking statements generally can be identified by use of phrases or terminology such as "may," "believes," "enthusiastic," "demonstrates," " intends," "optimistic," and "plans" or other similar words or the negative of such terminology. Similarly, descriptions of Mannatech's objectives, strategies, plans, goals or targets contained herein are also considered forward-looking statements. Mannatech believes this release should be read in conjunction with all of its filings with the United States Securities and Exchange Commission and cautions its readers that these forward-looking statements are subject to certain events, risks, uncertainties, and other factors. Some of these factors include, among others, Mannatech's inability to attract and retain associates and members, increases in competition, litigation, regulatory changes, and its planned growth into new international markets. Although Mannatech believes that its expectations, statements, and assumptions reflected in these forward-looking statements are reasonable, it cautions its readers to always consider all of the risk factors and any other cautionary statements carefully in evaluating each forward-looking statement in this release, as well as those set forth in its latest Annual Report on Form 10-K, and other filings filed with the United States Securities and Exchange Commission, including its current reports on Form 8-K. All of the forward-looking statements contained herein speak only as of the date of this release.